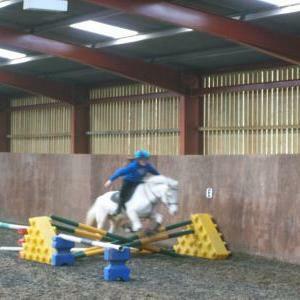 We do teach Jumping orientated riding lessons in our Floodlit 40x20m Indoor Arena. We offer them Private (30 minutes maximum) and to a Group of 4 riders (60 minutes maximum). There is a height limit of 3ft whenever a Riding School horse is being used, please don't ask to go higher. Jumping lessons focus on Jumper class skills, typically strides, pace, balance and maintaining good rythem. For those riders who wish to take their riding further, we do run regular Jumping Lessons for both Individuals (Private Jumping Lessons) and a Group of 4 (Group Jumping Lessons). A Private jumping lesson will be 30 minutes in duration, because of their intensive nature, which is tiring for both the horse and rider, we don't offer longer. A Group Jumping Lesson will be 60 minutes in duration, the jumping activity is more spread out, but is still tiring for the horses and riders. The lesson structure varies, although for riders of appropriate experience, the teaching will involve strides, pace, balance and how to maintain good rythem. We have a maximum height limit of 3ft, this is to protect our horses, Jumping places a lot of strain on horses legs, so we try to mitigate any potential problems by having a maximum height limit for Riding School Horses and Ponies. For those with their own horses, the height limit is down to your ability, and that of your horse, but we won't let you jump higher than we feel is safe. We have a range of obstacles, from trotting poles, show jumps, walls, and a water jump. The vast majority of Jumping Lessons is taught in our Floodlit 40x20m Indoor Arena, which is one of the largest in the area. You'll find jumping very challenging, and great fun! We offer significant discounts on all our riding!. We offer discounted Jumping lessons, RRC can apply, but it's unlikely we run a Jumping only Group Lesson every week. If you already maintain a Primary Regular Riders Club booking, you can attend a Jumping Only lesson at a heavility discounted rate (Club+). All our usual Terms and Conditions apply for Private Lessons. The Regular Riders Club has further Rules governing it, these will be provided when joining the club.